1.1. 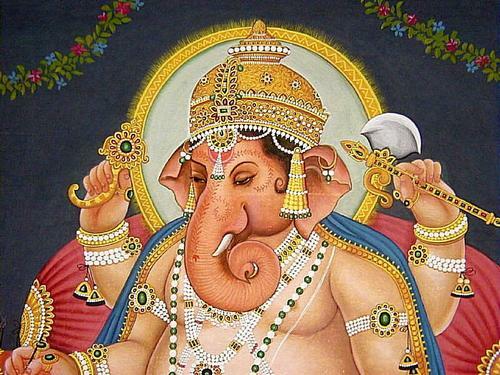 The earliest reference to Ganapathi appears in the second book of the Rig Veda in the rik starting with Gananam tva Ganapati Gum Havamahe (RV 2.23.1). The Ganapathi invoked here, is the Chief of the Ganas, the leader of the group, a superb seer among seers, and the lord of the mantras. It is explained that Ganapathi in this rik refers to Brahmanaspati, a Vedic divinity of the highest order, the leader of the heavenly bands and a sage (kavi) among sages (Jyeshta Rajam Brahmanam, Brahmanaspata). 1.2. 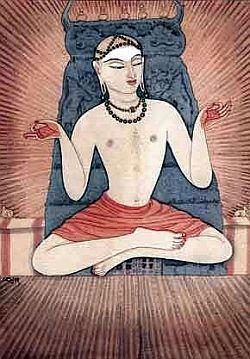 In the Rig Veda, Brahmanaspati is the lord of all sacred prayers and lord of Satya mantra. He is the destroyer of enemies; and no sacrifice is complete without invoking him. Brahnanaspati was a partner with Brahma in creation. Brahmaņaspathi was also the middle term that once linked the Vedic Brahma and Brihaspathi’. They are the names “of a deity in whom the action of the worshipper upon the gods is personified”. 1.3. Brihaspathi is the personification of piety, purity and knowledge. He is called `the father of the gods,’ and a widely extended creative power is ascribed to him. He is also `the shining’, `the gold-colored,’ and `having the thunder for his voice.” Other epithets of Brihaspati are Jiva – the living, Didivis – the bright, Dhishana – the intelligent, and for his eloquence, Gishpati– the lord of speech. There are over one hundred riks in praise of these two deities, giving a picture of their powers and personalities. 1.4. 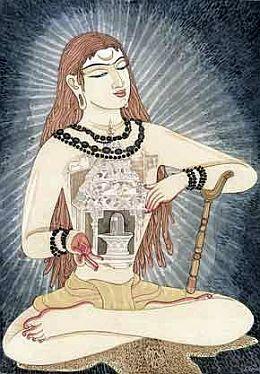 The Gaņapathi in Rig-Veda is the lord of gaņas or hosts. In the Rig-Veda, the gaņās or hosts of Bŗihaspathi—Brahmaņaspathi are the chants, the riks and the stomas, the words of praise (RV. 4.50.5). They have little to do with the lower vital levels. 1.5. The term Gana also denotes a host of angles (Devas). 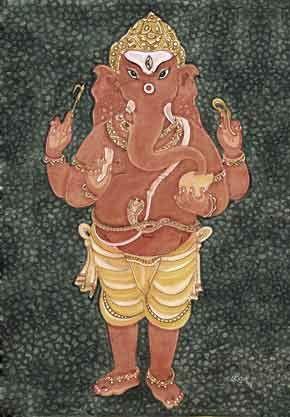 Indra is referred to as Ganapathi in the tenth book of the Rig Veda (RV. 10.112.9); Indra is the Lord of the companies (Maruts). 1.6. The mantra ‘namo Ganebhyo ganapathibyasha vo namo’ (16-25) that occurs in Shukla Yajurveda samhita refers to ganas, in plural, and says: salutations to you, Ganas and to the Lord of the Ganas. This mantra appears also in the Rudra prasnam (4.1.5) and in the Maitrayani-Samhita (2,9.4). Gana in these contexts signifies a group of people as also a collection of mantras. 1.7. 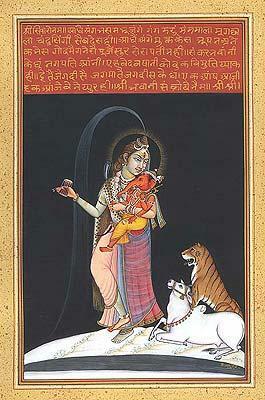 The Taittiriya samhita interprets Ganas as pashus (the beasts of Shiva). They are the Ganas of Shiva — Rudrasya Ganapathyam .There were also Bhuta ganas, the weird and grotesque looking guards of Shiva. Thus, Shiva the Pashupathi; and Shiva the Bhoothnath was also a Ganapathi. 1.8. At a much later period, when the Puranas came to be compiled, the virtues and powers of all the Ganapathis of the past were transferred to the Ganapathi as we are familiar with; that is to our Ganapathi. He became the Lord of Ganas in every sense of the term. Not only that, he became much larger than the sum of the parts. 1.9. It is not significant what shades of meanings the term carried in the past; but it is very important for us that our Ganapathi, the Lord of Ganas, whom we worship with love and adoration, is the embodiment of all the grace, virtues and powers that we admire in any god. He is the inheritor of the combined wisdom and glory of all the gods; and is much more than the sum. He is Maha Ganapathi. That is what really matters. 2.1. It is not certain how the Ganapathi-elephant association came into being. The earliest reference in that regard is in the Atharva Veda which alludes elephantine countenance (hasthi –varchas) to the Vedic god Brihaspati who was one of the forerunners of our Ganapathi. Our Ganapathi seems to have inherited his features from the descriptions of Brihaspati. 2.2. 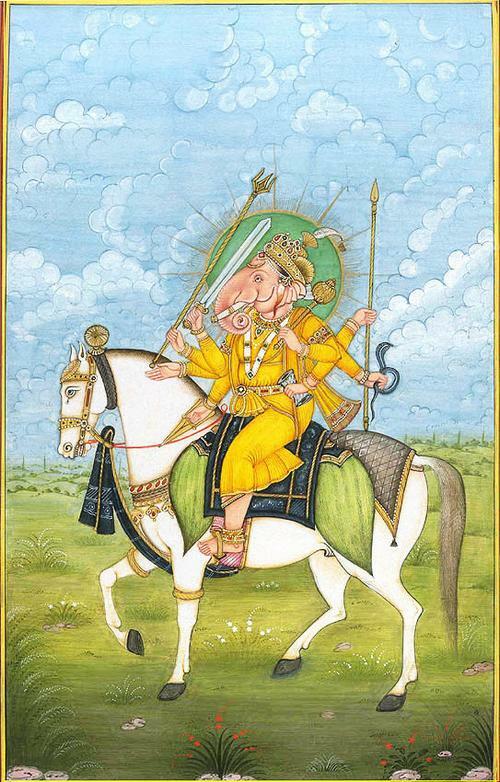 The other early references are in Maitrayani samhita (2.9.1) and Taittiriya Aranyaka (10.1.5) which appeal to an elephant faced (hasthi-mukha) , single-tusked (dantin) deity with a curved trunk (vakra tunda).He is also described as holding a corn-sheaf, a sugarcane and a club. Those features became the characteristics of our Ganapathi, the Ganesha. 2.3. 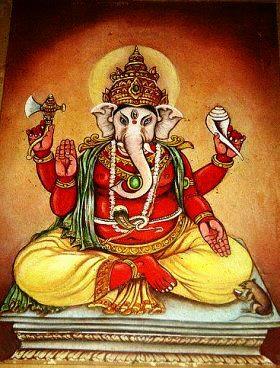 Amarakosha the Sanskrit lexicon (say 4th century AD), lists eight synonyms of Ganesha : Vinayaka, Vighnaraja, Dvaimtura (one who has two mothers), Gaṇadhipa (equivalent to Ganapati and Ganesha), Ekadanta (one who has one tusk), Heramba, Lambodara (one who has a pot belly, or, literally, one who has a hanging belly), and Gajanana having the face of an elephant). It seems by then the Ganapathi and his half- elephant form were quite well established. 2.4. Vishnudharmottara, a text dated around 5-6th century, while detailing how to make images of various deities, describes, among others, how the image of Vinayaka should be made (Part Three; Ch 71; verses 1-18). 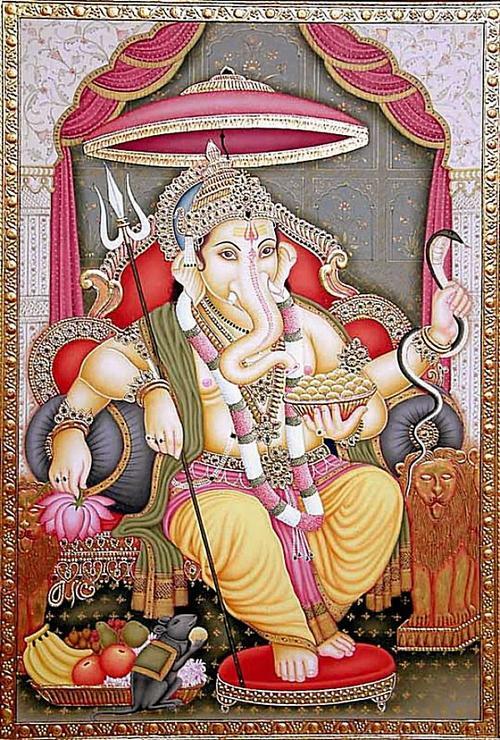 Sage Markandeya explains: Vinayaka should have the face of an elephant and four hands .He should have a big belly; stiff pair of ears; wearing a tiger skin around his waist and a sacred-thread across his left shoulder down his belly. He should have snake as belt. a trident and rosary should be placed in right hands; an axe and a pot full of sweets in the left ones. The sweet-pot should be placed near the tip of his trunk. His left tusk should be left un-represented. 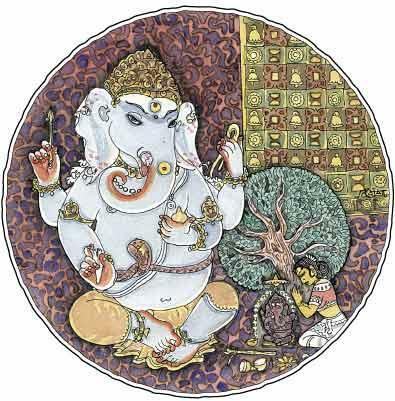 Vinayaka should be provided a foot-stool; and his one foot should be placed on it. 2.5. Before I end this segment let me add, the Tamil language, one of the oldest languages in the world, fondly addresses Ganapathi as Pille or Pilleyar, meaning the little darling or a small child. Some scholars say that term pille also meant, in old Tamil, a young elephant. Incidentally, the Pali word pillaka also means a young elephant. The association of a sweet looking child with the innocent countenance of a young elephant could also have had its origins in tribal lore. 3.1. Brahmanaspati of the Rig Veda was the divine being who led the aspirant along the path of wisdom and facilitated his progress by removing the obstacles in his path. It is said, this aspect of Brahmanaspati was later expanded in to the role of Ganapathi as Vinayaka, the destroyer of obstacles. 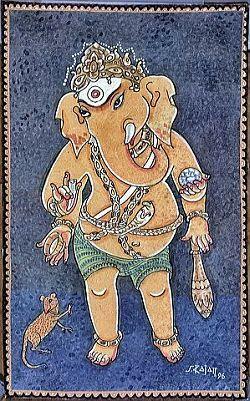 But Ganapathi is also the lord of obstacles (Vighnaraja).But, why would a benevolent god cause obstacles? 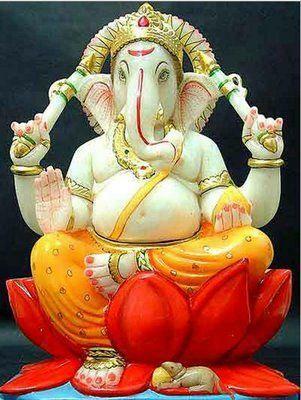 It is explained that Ganapathi does not cause obstacles but controls obstacles. It is therefore prudent to pray to him before launching on any venture – big or small. 3.2. He intercedes with gods on behalf of humankind and protects them from the wicked influences. Thus, Ganapathi as the destroyer of obstacles had taken root by about first century AD. 4.2. Siddham was in the distant past one of the names given to the collection of Sanskrit alphabets. Patanjali explained the term as “that which is established”. The beginners would commence their learning of the alphabets with the chant: ”Om namo Siddham”. Even the scribes of the epigraphs would etch an inscription starting with the words “siddham or Swasthi”. Since Ganapathi evolved also into the god of wisdom and learning the terms Siddham and Swasthi too came to be associated with him. 4.3 Ganapathi is the patron god of wisdom and all branches of learning; not merely spiritual or of art or music or literature but of all human endeavours. 5.1. I reckon the Ganapathi worship has a history of about two thousand years. The ancient Grihya sutras and Dharma sutras do not mention about praying to Ganapathi at the commencement of a worship-ritual. Natyasastra, dated around second century BCE, too, does not refer to Ganapathi. 5.2. Perhaps the first reference to Ganapathi worship occurs in the Gobhila Grhya Sutra, which belongs Sama Veda. It recommends praying to Ganapathi and to Matrikas at the commencement of a ritual, seeking blessings and support for a smooth and successful completion of the ritual process. Gobhila Grhya Sutra is dated around first century AD. From then Ganapathi has carried on famously. 5.3. Baudhayana Grihya Sutra which described Ganapathi as Vigneshwara, Bhootha-natha and Gajamukha, too recommended similar worship of Ganapathi. It also prescribed offering apupa and Modakas to propitiate him. The date of this text is disputed; it could perhaps be around the same time as the other Sutras. 5.4. Another text of first century, Gatha-saptha-shati, sings the praise of Ganadhipathi. 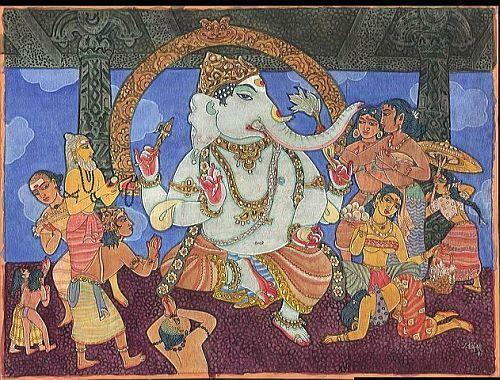 The Puranas, which came about around that period too carry detailed references to Ganapathi and to his worship (e.g. Varaha Purana, Vamana Purana and Brahmaiva-vartha purana). 5.6. The Yajnavalkya Smriti (dated around third century AD) mentions Vinayaka as the Lord of the Ganas, appointed by Brahmna and Rudra. Here he is described as one who causes obstacles as well as one who removes them. Yajnavalkya gives four names of Vinayaka the son of Ambika as: Mita, Sammita, Salakantaka and Kusumandarjaputra .Vinayaka here is worshiped as a Tantric deity. 6.1. 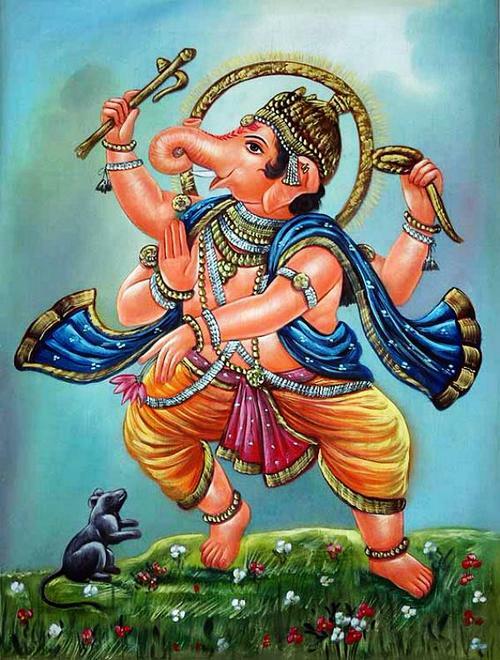 Ganesha appeared in his classic form as a clearly-recognizable deity with well-defined iconographic attributes in the early 4th to 5th centuries. 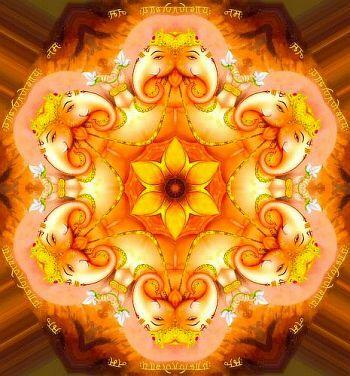 Ganesha images thereafter became prevalent in all parts of India and in many parts of the world. 6.2. Ganesha emerged as a distinct deity in clearly recognizable form in the fourth and the fifth centuries during the Gupta period. His popularity rose quickly. 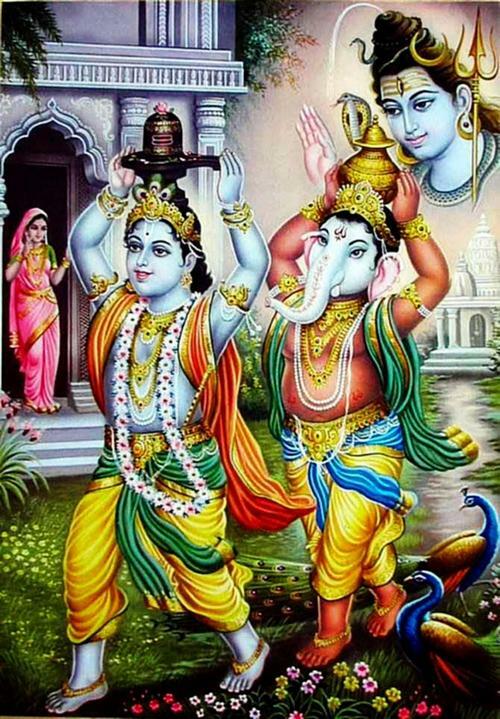 The son of Shiva and Parvati; Ganesha with an elephantine countenance, a curved trunk, pair of big ears and a pot-bellied body of a human is now the Lord of success; and destroyer of evils and obstacles. He is the god of education, knowledge, wisdom and wealth. Ganesha also became one of the five prime Hindu deities (Surya, Vishnu, Shiva and Durga being the other four) worshipped in the panchayatana puja. A new tradition called Ganapathya thereafter came into existence. 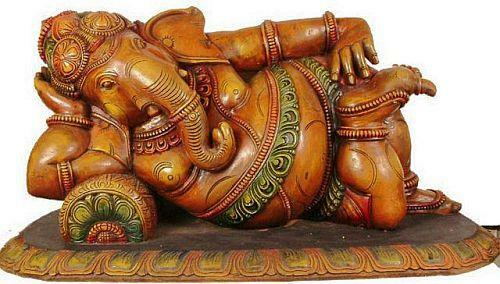 Perhaps no other god , either in Hindu or any other religion, been depicted in as many varieties of forms as Ganesha has been. He has been depicted in every conceivable form. 6.3. With the spread of Indian trade to the Far- East, by around the tenth century, Ganesha a favorite with the traders and merchants reached the shores of Bali, Java, Cambodia, Malaya, Thailand, Vietnam and other islands. In Indo-china, where Hinduism and Buddhism were practiced side by side and influenced each other, Ganesha was the God acceptable and dear to all. Even to today, the people in Burma, Vietnam, Cambodia and Thailand worship Ganesha as the destroyer of obstacles and as the god of success. In Thailand, Ganesha is called Phra Phikanet or Phra Phikanesuan and is worshiped as the deity of fortune and success, and the remover of obstacles. He is associated with arts, education and trade. 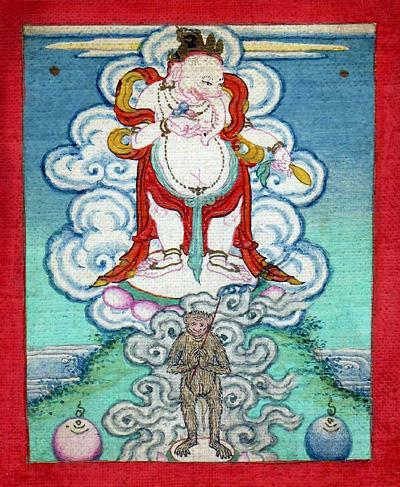 Ganesha appears in the emblem of the Department of Fine Arts in Thailand. As lord of business and diplomacy, he sits on a high pedestal outside Bangkok’s Central World (formerly World Trade Center), where people offer flowers, incense and a reverential sawasdee Thai Cuisine. 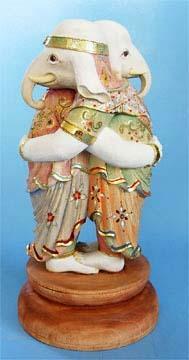 With regards to Indonesia, Ganesha is called the ‘Indonesian God of Wisdom’. Bandung boasts a Ganesha Street. A Ganesha statue from the 1st century AD was found on the summit of Mount Raksa in Panaitan Island, the Ujung Kulon National Park, West Java. While there are not temples dedicated specifically to Ganesha, he is found in every Shiva shrine throughout the islands. An 11th-century CE Ganesha statue was found in eastern Java, Kediri is placed in The Museum of Indian Art (Museum fur Indische Kunst), Berlin-Dahlem. The 9th century statue of Ganesha resides in western cella (room) of Prambanan Hindu temple. 6.4. Ganesha appears in Jainism too. A fifteenth century Jain text provides procedures for the installation of Ganapathi images. Images of Ganesha appear in the Jain temples of Rajasthan and Gujarat; the earliest of which is dated around eighth century. 7.5. 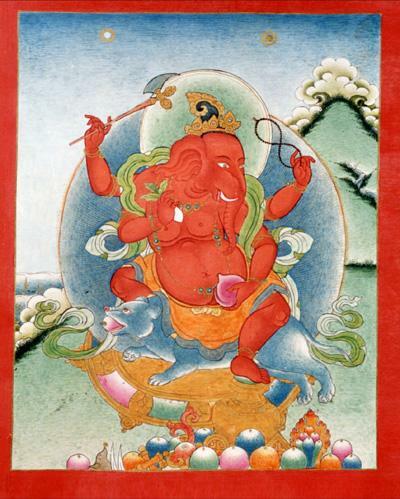 In Buddhism, Ganesha appears not only in the form of the Buddhist god Vināyaka, but also as a Hindu demon form with the same name (Vināyaka). 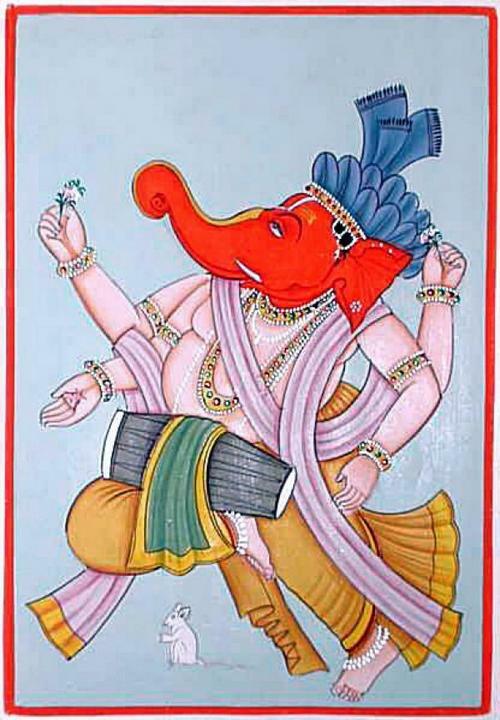 As the Buddhist god Vināyaka, he is the dancing Nritta Ganapathi. 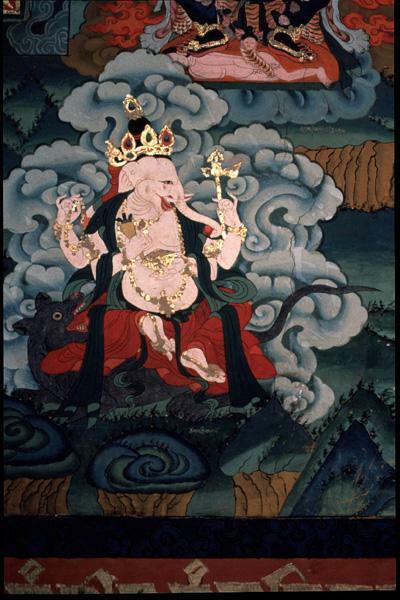 Worship of Ganesha is popular also in Tibet. According to another version, Ganesha as siddhidata (bestower of success) is Buddha himself revealing Ganesha’s powers to his disciple. 7.6. 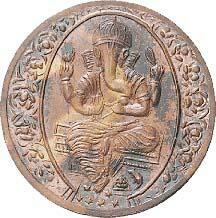 Ganesha traveled to other countries along with Buddhism. In northern China, the earliest known stone statue carries an inscription dated to 531AD.In Japan the Ganesha cult was first mentioned in 806 AD; and is still flourishing. Here, Buddha and ganesha are worshiped together. 8. Whatever might have been his origins, The Ganapathi -Ganesha that we know and adore represents the combination and culmination of the virtues and powers of all the Ganapathis that preceded him. He is the sum and substance of all the preceding Ganapathis .He is the embodiment of all their grace and wisdom .He is adored by one and all; by all segments of the society and of all ages. 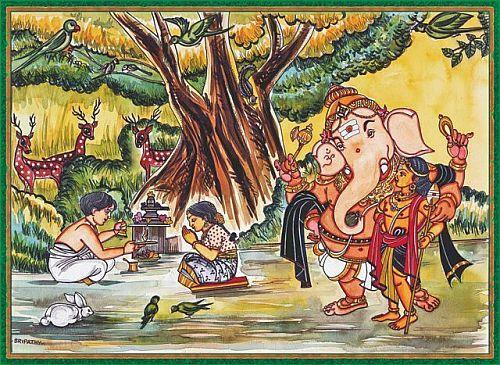 Children, particularly, love Ganesha as a playful mate and as the best friend. The little Ganesha is a darling. There are 250 temples of Ganesha in Japan. In Japan, Ganesha is known as ‘Kangiten’, the God of fortune and the harbinger of happiness, prosperity and good. Young Japanese worship Ganesha to win in love whereas the old worship the deity to get success in business. 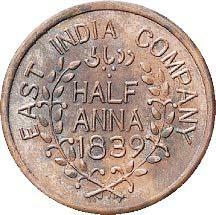 The British East India Company in 1839 issued a copper ½ Anna coin measuring 32mm with reeded edge and weighing 12.81 grams. The coin carried the Ganesha image on the obverse. Another bronze coin weighing 3.4 grams and measuring 16.4 x 15.5mm; the obverse depicts Ganesha seated facing, while the reverse has a lattice design that is rather common to certain areas of India. But, I am unable to say to which state or era the coin belongs. Kurundwad –court Fee stamp with Ganesha motif . Kurundwad (Senior Branch) in Kolhapur District the erstwhile British Bombay Presidency issued a Court Fee paper of Rupees Forty featuring Ganesha at its centre. 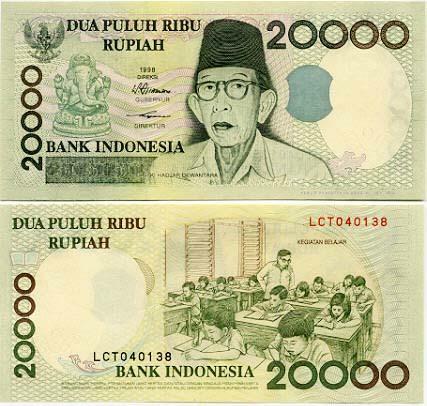 One of the Indonesian currency notes carries the picture of Ganesha. 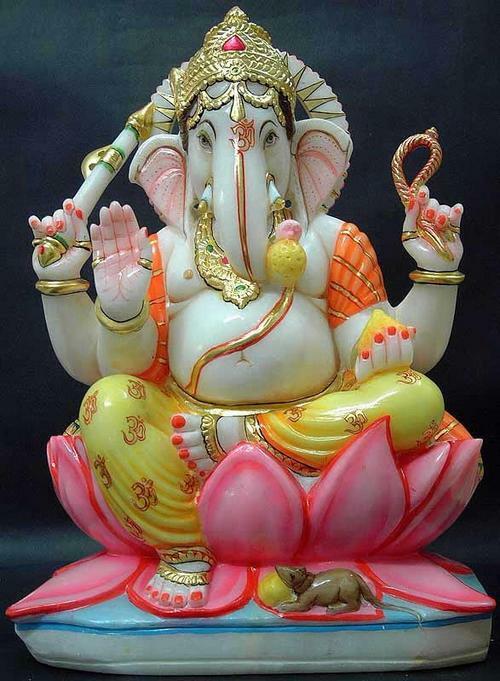 “Ganesha is the God of knowledge and Ganesha’s vehicle is the mouse .Hence the computer industry association selected Ganesha as the presiding Deity of Silicon Valley. The Hindu temples are complex institutions. They represent the culmination of social and religious aspirations of a society. Temple is the focal point in the life of a community and often represents its pride, identity and unity. It is also the index of the community’s wellbeing. It draws into its fold people from its various segments and denominations; and binds them together. In smaller communities the temple apart from being a source of spiritual or religious comfort, also serves as centre for education and recreation. A temple is also a treasure house of art and architecture, designed according to the principle of Vaastu Shastra, characterized by their majesty, serenity and beauty of intricate sculpture and designs. A temple evokes in the visitor a sense of beauty in art and in life as well. It lifts up his spirit, elevates him to a higher plane dissolving his little ego. At the same time, it awakens him to his insignificance in the grand design of the Creator. The most significant aspect of the temple worship is its collective character. Peoples’ participation is both the purpose and the means of a temple. The community is either actually or symbolically involved in temple worship. The rituals that dominate temple worship are therefore socio- religious in character. The worship in a temple has to satisfy the needs of individuals as also of the community. The worships that take place in the sanctum and within the temple premises are important; so are the festivals and occasional processions that involve direct participation of the entire community. They complement each other. While the worship of the deity in the sanctum might be an individual’s spiritual or religious need ; the festival s are the expression of a community’s joy , exuberance , devotion , pride and are also an idiom of a community’s cohesiveness . The appointed priests carry out the worship in the temple on behalf of other devotees. It is hence parartha, a service conducted for the sake of others. Priests, generally, trained in ritual procedures, pursue the service at the temple as a profession. As someone remarked, “other people may view their work as worship, but for the priests worship is work.” They are trained in the branch of the Agama of a particular persuasion. The texts employed in this regard describe the procedural details of temple worship, elaborately and precisely. The term Agama primarily means tradition; Agama represents the previously ordained practices generally held in regard (Agama loka-dharmanaam maryada purva-nirmita -Mbh 8.145.61). Agama is also that which helps to understand things correctly and comprehensively. Agama Shastras are not part of the Vedas. The Agamas do not derive their authority directly from the Vedas. They are Vedic in spirit and character and make use of Vedic mantras while performing the service. The Agama shastras are based in the belief that the divinity can be approached in two ways. It can be viewed as nishkala, formless – absolute; or as sakala having specific aspects. Nishkala is all-pervasive and is neither explicit nor is it visible. It is analogues, as the Agama texts explain, to the oil in the sesame-seed, fire in the fuel, butter in milk, and scent in flower. It is in human as antaryamin, the inner guide. It has no form and is not apprehended by sense organs, which includes mind. Sakala, on the other hand, is explicit energy like the fire that has emerged out of the fuel, oil extracted out of the seed, butter that floated to the surface after churning milk or like the fragrance that spreads and delights all. That energy can manifest itself in different forms and humans can approach those forms through appropriate means. The Agamas recognize that means as the archa, the worship methods unique to each form of energy-manifestation or divinity. The Vedas do not discuss about venerating the icons; though the icons (prathima or prathika) were known to be in use. Their preoccupation was more with the nature, abstract divinities and not with their physical representations. The Vedas did however employ a number of symbols, such as the wheel, umbrella, spear, noose, foot-prints, lotus, goad and vehicles etc. These symbols, in the later ages, became a part of the vocabulary of the iconography. The idea of multiple forms of divinity was in the Vedas .They spoke about thirty-three divinities classified into those of the earth, heaven and intermediate regions. 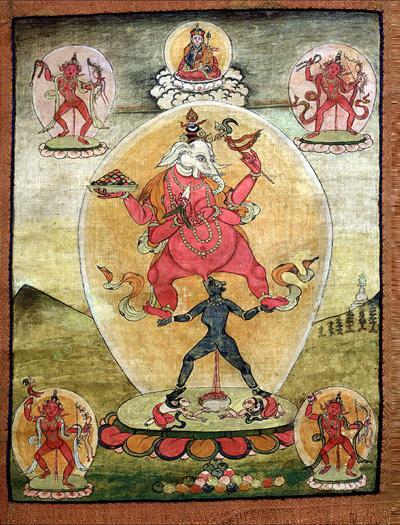 Those comprised twelve adityas, aspects of energy and life; eleven rudras, aspects ferocious nature; eight vasus, the directional forces; in addition to the earth and the space. The aspects of the thirty-three divinities were later condensed to three viz. Agni, the aspect of fire, energy and life on earth; Vayu, the aspect of space, movement and air in the mid-region; and Surya the universal energy and life that sustains and governs all existence, in the heavenly region, the space. This provided the basis for the evolution of the classic Indian trinity, the Brahma, Shiva and Vishnu. Rig Veda at many places talks in terms of saguna, the supreme divinity with attributes. The Vedanta ideals of the absolute, attribute- less and limit-less universal consciousness evolved as refinements of those Vedic concepts. The Upanishads are the pinnacles of idealism that oversee all horizons. But, in practice common people worshipped variety of gods in variety of ways for variety of reasons. They are relevant in the context of each ones idea of needs and aspirations; fears and hopes; safety and prosperity; and, the pleasures and pains. One often hears Agama and Nigama mentioned in one breath as if one follows the other or that both are closely related. However, Nigama stands for Vedas and Agama is identified with Tantra.The two traditions- Veda and Tantra – hold divergent views on matters such as God; relationship between man and God; the ways of worship; and path to salvation etc.The Vedic concept of God is omniscient, omnipotent, a formless absolute entity manifesting itself in phenomenal world of names and forms. 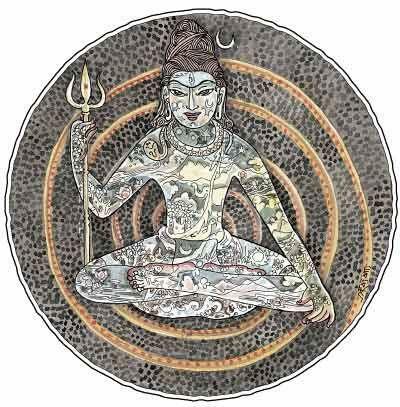 The Agama which is a part of Tantra regards God as a personal deity with recognizable forms and attributes. Vedic worship is centered on the fire (the Yajna), certain religious and domestic rituals, (shrauta sutraas and griyha sutraas), and the sacraments, (samskaara). In this tradition, the gods and their descriptions are, mostly, symbolic. The hymns of the Rig Veda are the inspired outpourings of joy and revelations through sublime poetry. The Yajur and Sama Vedas do contain suggestions of sacrifices; but they too carry certain esoteric symbolic meaning. Very few of these rituals are in common practice today. The most widespread rituals of worship today are of the Aagamic variety. The Agama methods are worship of images of God through rituals (Tantra), symbolic charts (Yantra) and verbal symbols (Mantra). Agama regards devotion and complete submission to the deity as fundamental to pursuit of its aim; and hopes that wisdom, enlightenment (jnana) would follow, eventually, by the grace of the worshipped deity. The Agama is basically dualistic, seeking grace, mercy and love of the Supreme God represented by the personal deity, for liberation from earthly attachments (moksha). As compared to Vedic rituals (Yajnas) which are collective in form, where a number of priests specialized in each disciple of the Sacrifical aspects participate; the Tantra or Agamic worship is individualistic in character. It views the rituals as a sort of direct communication between the worshipper and his or her personal deity. The Yajnas always take place in public places and are of congregational nature; and in which large numbers participate with gaiety and enthusiasm. A Tantra ritual, on the other hand, is always carried out in quiet privacy; self discipline and intensity is its hallmark, not exuberance or enthusiasm. The temple worship is the culmination of dissimilar modes or streams of worship. Here, at the temple, both the Agama worship-sequences and the symbolic Tantric rituals take place; but each in its sphere. A temple in Hindu tradition is a public place of worship; several sequences of worship are conducted in full view of the worshipping devotees; and another set of Tantric rituals are conducted by the priests in the privacy of the sanctum away from public gaze. The worship or service to the Deity is respectfully submitted to the accompaniment of chanting of passages and mantras taken from Vedas. There also plenty of celebrations where all segments of the community joyously participate (janapada) with great enthusiasm and devotion; such as the periodic Utsavas, processions, singing, dancing, playacting, colorful lighting, spectacular fireworks , offerings of various kinds etc. ; as also various forms of physical austerities accompanied by sincere prayers. It could be argued that a representation of the Supreme Godhead is theoretically impossible; yet one has also to concede that an image helps in contemplation, visualization and concretization of ideas and aspirations. Towards that end, the worship in a temple takes the aid several streams ideologies and practices. The temple worship , per se, is guided by its related Agama texts which invariably borrow the mantras from the Vedic traditions and the ritualistic details from Tantric traditions. This has the advantage of claiming impressive validity from Nigama, the Vedas; and at the same time, carrying out popular methods of worship. For instance, the Bodhayana shesha sutra and Vishhnu-pratishtha kalpa outline certain rite for the installation of an image of Vishnu and for conduting other services. 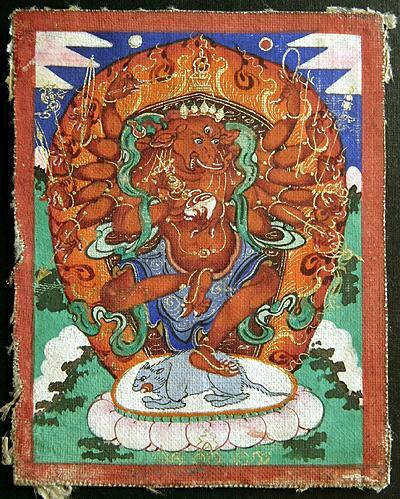 The Agama texts combined the rules of the Grihya sutras with the Tantric practices and formed their own set of rules. 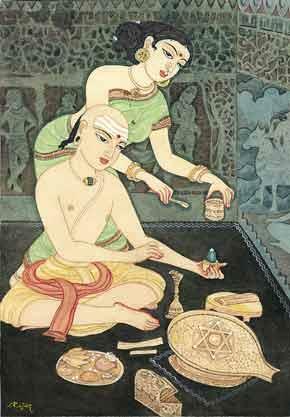 While installing the image of the deity, the Grihya Sutras do not envisage Prana-prathistapana ritual (transferring life into the idol by breathing life into it); but the Agamas borrowed this practice from the Tantra school and combined it with the Vedic ceremony of “opening the eyes of the deity with a needle”. While rendering worship to the deity the Agamas discarded the Tantric mantras; and instead adopted Vedic mantras even for services such as offering ceremonial bath , waving lights etc. though such practices were not a part of the Vedic mode of worship. The Agamas, predominantly, adopted the Vedic style Homas and Yajnas, which were conducted in open and in which a large number of people participated. But, the Agamas did not reject the Tantric rituals altogether; and some of them were conducted within the sanctum away from common view.. The Vaikhanasa Vasishnava archana vidhi, which perhaps was the earliest text of its kind, codified the of worship practices by judicious combination of Vedic and Tantric procedures. In addition, the worship routine was rendered more colorful and attractive by incorporating a number of ceremonial services (upacharas) and also presentations of music, dance, drama and other performing arts. It also brought in the Janapada, the popular celebrations like Uthsavas etc, These ensured larger participation of the enthusiastic devotees. The Agamas tended to create their own texts. That gave rise to a new class of texts and rituals; and coincided with the emergence of the large temples. It is not therefore surprising that town-planning, civil constructions and the arts occupy the interest of early Agamas. In due course the Agama came to be accepted as a subsidiary culture (Vedanga) within the Vedic framework. Agamas are a set of ancient texts and are the guardians of tradition . They broadly deal with jnana(knowledge), Yoga (meditation), Kriya (rituals) and Charya (ways of worship).The third segment Kriya(rituals) articulate with precision the principles and practices of deity worship – the mantras, mandalas, mudras etc. ; the mental disciplines required for the worship; the rules for constructing temples and sculpting the images. They also specify the conduct of other worship services, rites, rituals and festivals. The fourth one, Charya, deals with priestly conduct and other related aspects. [Incidentally, the Buddhist and the Jaina traditions too follow this four-fold classification; and with similar details]. The Texts hold the view that Japa, homa, dhyana and Archa are the four methods of approaching the divine; and of these, the Archa (worship) is the most comprehensive method. This is the faith on which the Agama shastra is based. The Agama shastra is basically concerned with the attitudes, procedure and rituals of deity worship in the temples. But it gets related to icons and temple structures rather circuitously. It says, if an image has to be worshipped, it has to be worship- worthy. The rituals and sequences of worship are relevant only in the context of an icon worthy of worship; and such icon has to be contained in a shrine. And an icon is meaningful only in the context of a shrine that is worthy to house it. That is how the Agama literature makes its presence felt in the Shilpa-Sastra, Architecture. The icon and its form; the temple and its structure; and the rituals and their details, thus get interrelated. The basic idea is that a temple must be built for the icon, and not an icon got ready for the temples, for a temple is really only an outgrowth of the icon, an expanded image of the icon. The Shipa Shatras of the Agamas describe the requirements of the temple site; building materials; dimensions, directions and orientations of the temple structures; the image and its specifications. The principal elements are Sthala (temple site); Teertha (Temple tank) and Murthy (the idol). I am not sure about the historical development of the Agamas. However, I think, the most of the present-day Hindu rituals of worship seem to have developed after the establishment of the six orthodox schools of Hindu philosophy (darshanas). The changes in religious rituals from the Vedic to the Aagamic seem consonant with the themes prevalent in the six orthodox systems. A very significant change is the integration of Yoga methodology into the rituals. Four of these eight stages are an integral part of all worship , namely, posture, (aasana), breath (life force)-control, (praanaayaama), placing or fixation, (nyaasa or dhaaranaa), and deep concentration and contemplation (dhyaana). . The temple architecture too follows the structure of the human body and the six chakras’ as in yoga. Surely the Agama tradition began to flourish after the 10th or the 11th century with the advent of the Bhakthi School. There are three main divisions in Agama shastra, the Shaiva, the Shaktha and Vaishnava. 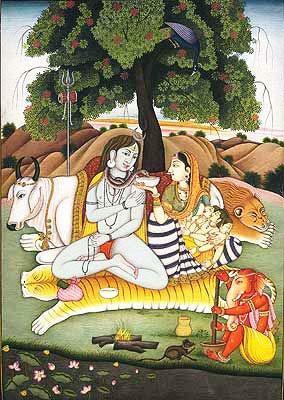 The Shaiva branch of the Agama deals with the worship of the deity in the form of Shiva. This branch in turn has given rise to Shaiva Siddantha of the South and the Prathyabijnana School of Kashmir Shaivisim. The Shaktha Agama prescribes the rules and tantric rituals for worship of Shakthi, Devi the divine mother. The third one, Vaishanava Agama adores God as Vishnu the protector. This branch has two major divisions Vaikhanasa and Pancharatra. The latter in turn has a sub branch called Tantra Sara followed mainly by the Dvaita sect (Madhwas). Each Agama consists of four parts. The first part includes the philosophical and spiritual knowledge. The second part covers the yoga and the mental discipline. The third part specifies rules for the construction of temples and for sculpting and carving the figures of deities for worship in the temples. The fourth part of the Agamas includes rules pertaining to the observances of religious rites, rituals, and festivals. Agama is essentially a tradition and Tantra is a technique; but both share the same ideology.But, Agama is wider in its scope; and contains aspects oh theory, discussion and speculation. The term Agama is used usually for the Shaiva and Vasishnava traditions and the Shaktha cult is termed as Tantric. But, there is an element of Tantra in Agama worship too, particularly in Pancharatra. As regards Vaikhanasa, after the emergence of temple – culture, Vaikhanasa appear to have been the first set of professional priests and they chose to affiliate to the Vedic tradition. That may perhaps be the reason they are referred to also as Vaidikagama or Sruthagama. Yet, there is no definite explanation for the term Vaikhanasa. Some say it ascribed to Sage Vaikhanasa whowho taught his four disciples: Atri, Bhrighu, Kasyapa, and Marichi; while some others say it is related to vanaprastha, a community of forest-dwellers. Vaikhanasa claim to be a surviving school of Vedic ritual propagated by the sage Vaikhanasa. The Vaikhanasa tradition asserts that it is the most ancient; traces its origin to Vedas and steadfastly holds on to the Vedic image of Vishnu. For the Vaikhanasa, Vishnu alone is the object of worship; and that too the pristine Vishnu in his Vedic context and not as Vasudeva or Narayana. Though it admits that Vasudeva or Narayana could be synonyms for Vishnu, it prefers to address the Godhead as Vishnu, the Supreme. Vaikhanasa worship is, therefore, essentially Vishnu oriented. And, it assures that when Vishnu is invoked and worshipped, it means the presence of all other gods and their worship too (Vishnor archa sarva devarcha bhavathi).Hence, according to Vaikhanasa, worship of Vishnu means worship of all gods. Agama Grihya sutras explain: the Godhead is formless –nishkala; filled with luster tejomaya; beyond comprehension achintya; and is of the nature of pure existence, consciousness and bliss sat-chit-ananda; and abides in the heart-lotus –hridaya-kamala– of the devotee. But because of the limitations of the human mind the worship of Brahman –with form, sakala, is deemed essential for all of us who live ordinary lives. The human mind finds it easier to deal with forms, shapes and attributes than with the formless absolute.A sense of devotion envelops the mind and heart when the icon that is properly installed and consecrated is worshipped with love and reverence.By constant attention to the icon, by seeing it again and again and by offering it various services of devotional worship, the icon is invested with divine presence and its worship ensures our good here (aihika) and also our ultimate good or emancipation (amusmika).That is the reason the texts advise that icon worship must be resorted to by all, especially by those involved in the transactional world. In the Agama texts, the Nishkala aspect continues to be projected as the ultimate, even as they emphasize the relevance and importance of the sakala aspect. The devotee must progressively move from gross sthula to the subtle sukshma. The worship of gods is of two modes: iconic (sa-murta) and non-iconic (a-murta).The Yajna, the worship of the divine through fire, is a-murta; while the worship offered to an icon is sa-murta. According to Vaikhanasas, though yajna might be more awe-inspiring, Archa (worship or puja) the direct communion with your chosen deity is more appealing to ones heart, is more colorful and is aesthetically more satisfying. The Vaikhanasas were greatly in favor of iconic worship of Vishnu; but they did take care to retain their affiliation to the Vedic tradition. Not only that; the Vaikhanasa redefined the context and emphasis of the Yajna. The Yajna, normally, is ritual dominant, with Vishnu in the backdrop. 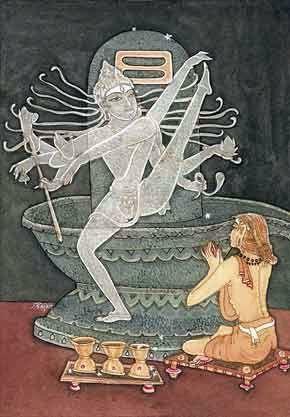 But, the Vaikhanasa interpreted Yajna as worship of Vishnu; and, Yajna as Vishnu himself (yajno vai Vishnuhu). The religious scene shifted from the Yajna mantapa to temple enclosures. Vedic rituals were gradually subordinated to worship of Vishnu. But, the Vedic rituals were not given up entirely.Employment of Vedic passages and mantras during the rites lent an air of purity and merit to the rituals.The Vedic rites too were incorporated into the worship sequences in the temple. Along with the rituals, it stressed on devotion to Vishnu and his worship. The Vaikhanasa thus crystallized the Vishnu cult and lent it a sense of direction. The very act of worship (archa) is deemed dear to Vishnu. The major thrust of Vaikhanasa texts is to provide clear, comprehensive and detailed guidelines for Vishnu worship. The Vaikhanasa texts are characterized by their attention to details of worship-sequences. It is not therefore surprising that Vaikhanasas do not employ the term’ Agama’ to describe their text .They know their text as ‘Bhagava archa-shastra’. The characteristic Vaikhanasa view point is that the pathway to salvation is not devotion alone; but it is icon-worship (samurtha-archana) with devotion (bhakthi). ‘The archa with devotion is the best form of worship, because the icon that is beautiful will engage the mind and delight the heart of the worshipper’. That would easily evoke feeling of loving devotion (bhakthi) in the heart of the worshipper. The icon is no longer just a symbol; the icon is a true divine manifestation enliven by loving worship, devotion, and absolute surrender (parathion). And, Vishnu is best approached by this means. The Agamas combine two types of scriptures: one providing the visualization of the icon form; and the other giving details of preparation of icon for worship. This is supplemented by prescriptions for worship of the image and the philosophy that underlies it. The Agamas also deal with building a shrine to Vishnu (karayathi mandiram); making a worship-worthy beautiful idol (pratima lakshana vatincha kritim); and worshipping everyday (ahanyahani yogena yajato yan maha-phalam). The Agamas primarily refer to ordering one’s life in the light of values of icon worship (Bhagavadarcha). It ushers in a sense of duty, commitment and responsibility. For worship, Godhead is visualized as in solar orb (arka-mandala) or in sanctified water-jala kumbha; or in an icon (archa-bera). When Godhead is visualized as a worship-worthy icon, a human form with distinguishable features (sakala) is attributed to him. Vishnu’s form for contemplation (dhyana) and worship (archa) is four armed, carrying shanka, chakra, gadha and padma. His countenance is beatific radiating peace and joy (saumya), delight to behold soumya-priya-darshana, his complexion is rosy pink wearing golden lustrous garment (pitambara). A beautiful image of Vishnu with a delightful smiling countenance and graceful looks must be meditated upon. As regards its philosophy, Srinivasa –makhin (c.1059 AD), a Vaikhanasa Acharya, terms it asLakshmi-Visitad-vaita.Though the term Visistadvaita has been employed, the philosophical and religious positions taken by Srinivasa –makhin vary significantly from that of Sri Ramanuja in his Sri Bhashya. Srinivasa –makhin in his Tatparya chintamani (dasa vidha hetu nirupa) explains that Brahman (paramatman) is nishkala (devoid of forms and attributes) as also sakala (with forms and attributes).They truly are one; not separate. The sakala aspect is distinguished by its association with Lakshmi (Prakrti). For the purpose of devotion and worship the sakala aspect is excellent. The Vaikhanasa therefore views its ideology as Lakshmi-visitadaita (the advaita, non-duality, refers to Vishnu associated with Lakshmi) Lakshmi is inseparable from Vishnu like moon and moonlight. Isvara associated with Lakshmi (Lakshmi visita isvara tattvam) is Vishnu. Those devoted to him as Vaishnavas.If Vishnu (purusha) grants release from the phenomenal fetters (Mukthi), Lakshmi (Prakrti) presides over bhukthi the fulfillment of normal aspirations in one’s life. The two must be worshipped together. Srinivasa –makhin explains that in the Pranava (Om-kara), O-kara represents Vishnu; U—Kara: Lakshmi and Ma-kara, the devotee. The Om-kara binds the three together. According to Vaikhanasa ideology, the four aspects of Vishnu -Purusha, Satya, Achyuta andAniruddha– are identified with Dharma (virtue), Jnana (wisdom), Aishvarya (sovereignty) and vairagya (dispassion). Of the four faces of Vishnu, the Purusha is to the East; Satya to the South; Achyuta to the west; and Aniruddha to the North. The four virtues or planes Vishnu are regarded the four quarters (pada) of Brahman: aamoda, pramoda, sammoda and vaikuntaloka (sayujya) the highest abode –parama pada. In the context of the temple worship and layout, the four forms represent the four iconic variants of the main image in the sanctum (dhruva bhera) which represents Vishnu. And, within the temple complex, each form is accorded a specific location; successively away from the dhruva bhera. Purusha symbolized by Kautuka-bera is placed in the sanctum very close to dhruva bhera; Satya symbolized by Utsava-bera (processional deity) is placed in the next pavilion outside the sanctum; Achyuta symbolized by snapana-bera (oblation) too is placed outside the sanctum; and Aniruddhda symbolized by Bali bera (to which food offerings are submitted) is farthest from the dhruva-bhera in the sanctum. As regards its differences with the other Vaishava –Agama the Pancharatra, the Texts such asprakina-adhikara (kriya-pada, ch 30 -5 to 11) mention that Vaikhanasa mode of worship is more in accordance with Vedic tradition (which does not recognize initiation rites such as branding);Vaikhanasa worshipper being deemed garba-vaishnava –janmanam; he is Vaishnava by his very birth, not needing any initiatory rites (diksha) or branding.The Vaikhanasa are distinguished by acceptance of Vishnu in his Vedic context. Vishnu is supreme; and Vishnu alone is the object of worship. Though they are now a recognized sect of Sri Vaishnavas, their allegiance to Sri Ramanuja as the Guru or to the Alvars or to the Visistadvaita philosophy is rather formal. They also do not recite passages from the Tamil Prabandham. The worship is conducted mainly through verses selected from Rig Veda and Yajur Veda; and performance of the yajna as prescribed in Krishna-yajur Veda. There is also not much use of the Tantra elements of worship such as uttering Beeja-mantras etc, except for the sequence of projecting the deity from ones heart into the icon; that is, the assumed identification of the devotee with the deity during the worship . The Vaikhanasa worshipper, in privacy behind the screen, recites the ‘atma-sukta’ aiming to enter into a state of meditative absorption with Vishnu. That is followed by the symbolic ritual placements (nyasas). The icon attains divinity after invocation (avahana) of life force; while divinity always abides in the worshipper. The Vaikhanasa is regarded orthodox for yet another reason; they consider the life of the householder as the best among the four stages of life. Because, it is the householder that supports, sustains and carries forward the life and existence of the society. They treat the worship at home as more important than worship at the temple. A Vaikhanasa is therefore required to worship the deities at his home even in case he is employed as a priest at the temple. There is not much prominence for a Yati or a Sanyasi in this scheme of things. They decry a person seeking salvation for himself without discharging his duties, responsibilities and debts to his family, to his guru and to his society. The Agama texts make a clear distinction between the worship carried out at his home (atmartha) and the worship carried out as priest at a temple(parartha ) for which he gets paid. This distinction must have come into being with the proliferation of temples and with the advent of temple-worship-culture. It appears to have been a departure from the practice of worship at home, an act of devotion and duty. Rig Vedic culture was centered on home and worship at home. The worship at home is regarded as motivated by desire for attainments and for spiritual benefits (Sakshepa). In the temple worship, on the other hand, the priest does not seek spiritual benefits in discharge of his duties (nirakshepa). He worships mainly for the fulfillment of the desires of those who pray at the temple. That, perhaps, appears to be the reason for insisting that a priest should worship at his home before taking up his temple duties. Traditionally, a person who receives remuneration for worshipping a deity is not held in high esteem. The old texts sneer at a person “displaying icons to eke out a living.” That perhaps led to a sort of social prejudices and discriminations among the priestly class. But, with the change of times, with the social and economic pressures and with a dire need to earn a living, a distinct class of temple-priests, naturally, crystallysized into a close knit in-group with its own ethos and attitudes. Whatever might be the past, one should recognize that temples are public places of worship; the priests are professionals trained and specialized in their discipline; and they constitute an important and a legitimate dimension of the temple-culture. There is absolutely no justification in looking down upon their profession. Similarly, the Agamas , whatever is their persuasion, are now primarily concerned with worship in temples. And, their relevance or their preoccupation, in the past, with worship at home, has largely faded away. From the end of the tenth century Vaikhanasa are prominently mentioned in South Indian inscriptions. Vaikhanasas were the priests of Vaishnava temples and were also the admistrators. However with the advent of Sri Ramanuja, who was also the first organizer of temple administration at Srirangam Temple, the Vaikhanasa system of worship lost its prominence and gave place to the more liberal Pancharatra system .Sri Ramanuja permitted participation of lower castes and ascetics , the Sanyasis ( who were not placed highly in the Vaikhanasa scheme) in temple services. He also expanded the people participation in other areas too with the introduction of Uthsavas, celebrations, festivals, Prayers etc. This change spread to other Vaishnava temples particularly in Tamil Nadu. Vaikhanasas, however, continues to be important in Andhra Pradesh, Karnataka and in some temples of Tamil Nadu. It was explained that while the srauta and smarta rituals of the Vedas were intended for the intellectuals, the Pancharatra was given to ordinary people who longed to worship with heart full of devotion and absolute surrender to the will of God. As regards Pancharatra, it appears to have been a later form of worship that gained prominence with the advent of Sri Ramanuja. Pancharathra claims its origin from Sriman Narayana himself. Here Vishnu is worshipped as the Supreme Godhead. Pancharatra described as ‘Bhagavata shastra’or ‘Vasudeva –matha’ is centered on worship of Vishnuthe Godhead (Bhagavan) as Narayana identified with Vasudeva of the Vrishni clan. He is regarded as Bhagavan as He is the manifestation of six divine attributes: jnana (omniscience), shakthi (omnipotence), bala (unhindered energy), aishvarya(sovereignty), virya (matchless valor)and tejas (great splendor). Pancharatra as a system of thought prescribes that worldly involvement must be minimized (nivrtti) in order to engage oneself exclusively in devotion to Bhagavan (ekanta bhakthi). The Pancharatra doctrine is associated with the Samkhya ideologies. Antaryamin, or the indwelling immanent form of God as present throughout in creation. The recognition of three modes of the Deity (para, vyuha and vibhava) assumes great importance in the context of Pancharatra ideology and practice of icon-worship (archa). The peak of Vaishnava devotion is in Dashamaskanda, the Tenth Book of the Bhagavata Purana, and in Nalayira Prabhandam the four thousand Tamil verses of the Vaishnava saints, the Alvars; and especially in the thousand songs known as Tiruvaimozhi of Nammalvar. The ecstasy of the Gopi-type of God – intoxicated-love is exhilarating and gives raise to divine intoxication in Nammalvar’s poetic compositions. Therefore, the Tamils verses and songs are prominent in Pancharatra worship. This method also employs more Tantras, Mandalas and Uthsavas which makes room for a large number of devotees of all segments of the society to participate. There are more Jaanapada (popular) methods of worship than mere Vedic performance of Yajnas. Even here, each prominent temple follows its favorite text. That is the reason there are some minor differences even among the Pancharatra temples. As regards the differences between the two systems, one of the major differences is their view of the Supreme Godhead Vishnu. The Vaikhanasas view Vishnu in the Vedic context ; as the all-pervading supreme deity as Purusha, the principle of life; Sathya, the static aspect of deity; Atchuta, the immutable aspect; and Aniruddha, the irreducible aspect. Here the worshipper contemplates on the absolute form (nishkala) of Vishnu in the universe and as present in the worshippers body; and transfers that spirit into the immovable idol (Dhruva Bheru) and requests the Vishnu to accept worship. Vishnu is then worshipped as the most honored guest. Lakshmi , Shri is important as nature, prakriti, and as the power, Shakti, of Vishnu. The smaller movable images represent Vishnu’s Sakala that is the manifest, divisible and emanated forms. The large immovable image representing Vishnu’s niskala form, ritually placed in a sanctuary and elaborately consecrated; and the smaller movable images representing Vishnu’s sakala form are treated differently. The Pancharatra regards Narayana and Vasudeva too as forms of Vishnu the Supreme Principle (Para). In his manifest form (Vyuha) he is regarded as Vasudeva, Sankarshana, Pradyumna, and Aniruddha,representing Krishna, his elder brother, his son and his grandson, respectively, who are brought together in worship and adoration as a complete body of divine power. It is explained that Vasudeva, the Supreme Brahman, out of compassion, voluntary assumed the bodily forms so that the devotees may have easy access to his subtle form. The approach to the divine is again graded. The devotee worships the Vibhava form; or the incarnation of God, on several occasions such as Rama , etc and moves on to worship the Vyuha forms. And , from Vyuha form he progresses to worship the subtle forms of Vasudeva. Among the other differences between Vaikhanasa and Pancharatra, the latter say, they gain eligibility to worship (Diksha) after the ceremonial Chkrankana, which is imprinting the symbols of Vishnu on their body. Vaikhanasa see no need for such a ritual. The pregnant mother is given a cup of Payasamwith the Vishnu seal in the cup. They recognize as worthy only such Garbha_Vaishnavas. Vaikhanasa follow the lunar calendar while the Pancharatra follow the solar calendar. Vaikhanasa consider Vishnu_Vishvaksena_Brighu as the guru_parampara; while Pancharatra considerVishnu_Vishvaksena_Satagopa_Nathamuni_Yamuna_Ramanuja as the guru -parampara. Vaikhanasa think it is enough if the daily worship is performed once in a day or, if needed be, stretched to six times in a day (shat kala puja). Pancharatra do not place any limit. If needed the service could be even 12 times a day, they say. The Vaikhanasa worship is considered more Vedic, the mantras being Sanskrit based and there is a greater emphasis on details of worship rituals and yajnas. Even here, the householders and celibates get priority in worshipping the deity. They consider Griha_archana the worship at home as more important than the congregational worship. The Sanyasis or ascetics have no place in this system. Whereas in Pancharatra, the emphasis is almost entirely on devotional idol worship than on yajnas; and more Tamil hymns are recited and there is greater scope for festivals , celebrations and processions where all sections of the society including ascetics can participate. What surely is more important than the rituals is the symbolism that acts as the guiding spirit for conduct of rituals. At a certain level, symbolism takes precedence over procedures. I think, ultimately, there is not much difference between Pancharatra and Vaikhanasa traditions. Both are equally well accepted. The differences, whatever might be, are not significant to a devotee who visits the temple just to worship the deity and to submit himself to the divine grace. The Shaiva Agama worship is less formal than the Vaishnava, less restrained and less accustomed to social forms of regulations. 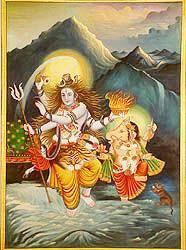 Siva is the Supreme God of the Shaiva system, who is Pati, or Lord over all creatures, the latter being Pashu, meaning animal or of beastly nature. The Jiva or the individual is caught in the snare of world-existence and attachment to objects. The grace of God, alone, is the means of liberation for the individual. The worship in Shaiva is graded in steps: Charya, or the external service rendered by the devotee, such as collecting flowers for worship in the temple, ringing the bell, cleaning the premises of the shrine, and the like; Kriya, or the internal service, such as actual worship as well as its preparations;Yoga, or seeking identity with Shiva; and Jnana, or wisdom, in which the Shiva and the seeker are one. In Southern Shaivism the great Shaiva saints Appar, Sundarar, Jnanasambandar andManikyavachagar, are said to represent, respectively, these four approaches to Shiva. Kashmir Shaivism is a world by itself. Similar is the Shakta Agama, the Tantra worship of Shakti, the Divine Mother. These subjects deserve to be discussed separately. Festivals – Uthsavas are an important and an integral part of temple worship. The most significant aspect of the temple worship is its collective character. Peoples’ participation is both the purpose and the means of a temple. Festivals are all about people’s participation. They are the occasions when all the devotees, irrespective of their status in the community, join and participate willingly with enthusiasm. Festivals help in binding the community together. The pomp, spectacle and splendor of festival s are the expressions of a community’s joy, exuberance, devotion, pride and are the idiom of a community’s cohesiveness. The term Uthsava (festival) has various shades of meaning; all suggesting an occasion of celebration and exuberance. The prefix “ut” suggests rising, excitement. Uthsava is an event that generates happiness and excitement (utsuthe harsham).The synonyms of the term in Amara Kosha, are Kshana (great moment), Uddharsha (excitement) and Mahah (auspicious occasion). The Agama texts carry a bouquet of interpretations for the term Uthsava. According to Uttara_karanagama (4.1) “Ut “stands for wisdom and “sava” is what ushers in wellbeing (savah kalyana kaaranam). Purushottama Samhita (32.20) says “Ut “is what is excellent (uthkrishta _vacha_nam) and “sava’ is yajnya (sacrifice).However , Naradiya Samhita (18) and Isvara_ samhita (10.3) carry a different set of meanings. According to them, “ut” means obstacle or impediment (vighnah) and “sava” is their elimination (udgatha).Thus, Uthsava is that which eliminates obstacles. Two other texts viz. Aniruddha_ Samhita (20.1) and Padma _Samhita (2.10) explain, “sava” is misery and “ut” is the act of tiding over that. Uthsava therefore takes one across sorrows. By all accounts, Uthsava is an occasion to rejoice. They are greatly meritorious too. Uthasavas are celebrated for a variety of reasons. Nevertheless, all have at their heart a wish and a prayer for the wellbeing, peace and prosperity of the people, the ruler and the state (prajanam api rastrasya sarva _abyudaya_ sadhakam; Purushottama_samhita 23.6); and to be rid of calamities, famine and terrible omens (durbiksha _durnimittadi_ ghoraanam_ shantidam— ibid).Uthsavas also renew the sanctity of the deities worshipped. Agama texts accord elaborate treatment to the subject of the Uthsavas. They classify the events in a variety of ways and analyze the ritual procedures in detail. Obviously, the Agama Shastras considered Uthsavas as events of great significance and importance. 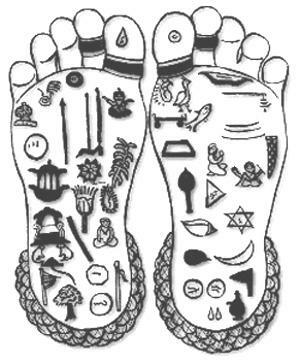 Uthsavas are classified according to the nature of the Utsava, the rituals involved, the mode of commencement, day of commencement, day of termination and the duration of the Uthsava. Satvika : Services rendered as ordained duty with no desires or expectations are Satvic in nature. These are essentially the Nitya sevas and regular festivities. These include, the festivals conducted on certain specified auspicious days as per a pre-determined schedule or those conducted at regular intervals, say, fortnight or month. Rajasa : These are Naimittika (occasional) Uthsavas conducted as purification measures because of an earth quake ;or eclipse ;or appearance of comet ;or damage to the temple tower by lightening or fire or other reason; famine; floods ;disturbance or damage caused to the image in the sanctum ;or occurrence of death within the temple premises ;or defilement caused to the temple in any other manner etc. Misra: These are of mixed merit. Kamyakas (Uthsavas arranged with a desire at the heart).The festivals arranged by the wealthy or influential donors for their own reason; or by others, for a payment, seeking fulfillment of their cherished desire; or the festivals to commemorate the temple building or for fulfillment of any desire. Karnagama text (24,424-5) classifies Uthsavas according to the rituals involved. According to this classification, there are four kinds. Sakalya: It is a complete form, involving all the rituals; hardly any ritual is ignored. Pavana: It is conducted for purifying the idol or the temple premises. This involves all the rituals except hoisting the temple flag (pathaka). Shanta: It is for ushering in peace; and involves–Homa in the morning, Bali(food offering) at noon, Uthsava (procession) in evening. Mangala: They are Auspicious rituals- as desired by the donor (yajamana). Agama texts Parameshwara Samhita (16, 28-29) and Naradiya Samhita (18, 7-8) make a threefold classification according to the rituals that commence the festivals (utsava_arambha). 1. Ankurarpana: to commence by offering the sprout , seeking happiness and prosperity (Sarva sampath samruddhidam).Seeds of nine or ten grains[ rice,gingelly,millet,tail-pepper,black-gram,mustard,bean called mudga , a legume called samba , kaulatta (dolichos uniflorus)] are sown in twelve earthen pots filled with mud ceremonially collected and placed on a certain specified mandala. Offerings are scattered in eight directions invoking their presiding deities to protect the sprouts. This ceremony is carried out during night, as moon is regarded the lord of plants. 2. Bheri_tadana: to commence by drum beating, for the delight of the Devas (Devanam priya vaham). Usually, One_day Uthsavas begin with drum beating, signifying invitation to the celestial beings to participate in the festival. 3. Dwajarohana: to commence by flag hoisting, that brings happiness to all beings (Sarva prani sukha_ vaham). All the three modes of commencements aim to bring about liberation of all beings (sarvesham mokshadam) and wellbeing of the ruler and the state (raja rastra sukha). Usually, the Uthsavas that last for five days or more commence with flag hoisting. Festivals conducted seeking wealth (Dhanada) and fulfillment of desires (Kamada) must commence with flag hoisting. It is optional for festivals seeking victory (Vijaya). Flag hoisting is not approved for commencement of Uthsavas seeking pacification (Shantika) and nourishment (Paustika). In case of Uthsavas lasting for more than five days ,the flag hoisting is done twenty-one days prior to the day appointed for the ceremonial bath (tirtha yatra) which comes towards the end of the Uthsava –Naradiya Samhita (18,17). The flag usually carries the figure of Indra, the chief of Devas; or of Garuda the carrier of Vishnu; or of Nandi Bull the vehicle of Shiva; or that of a god. The figures are painted ritualistically and the flag is hoisted in front of the temple, to signal the commencement of the Uthsava. The practices in the olden days required that once the flag was hoisted , no domestic rituals or functions like marriage be conducted in the village , till the flag is taken down on the day of Thirtha Yatra (ceremonial bath)—Padma_sancharya(10,42). The intention perhaps, was, to indicate that celebrations in honor of gods take precedence over that of humans. Thirtha Snana or Avabrhrta Snana, the ceremonial bath of the icons in the river or pond, marking the conclusion of the festival is a significant event in the festival. Often, the day of Thirtha Snana is first determined and the date of commencement of the Uthsava is then worked out (Purushottama Samhita, 23; Purva-karanagama, 141). It is best (satvika) if the Thirtha snana takes place on ninth day from the commencement of the Uthsava. It is middling (rajasa) if the Thirtha Snana is on the seventh day. It is inferior (tamasa ) if the Thirtha snana is on the fifth day. Agama texts such as Raurava kriya (18-8-9); Chandra jnana (21); Ajitagama (27, 2-7); Diptagama (83) and Purva_karana-agama (141, 2-3) classify the Uthsavas according to their duration. The Uthsavas are conducted for different purposes to please different set of gods; and each such Uthsava has a name. One day: One day Uthsava is Sambhava. Fifteen days: A fifteen-day Uthsava is Chandra. Diptagama text considers the last three (from 13 to 15 days) as uttama (superior); the middle three (from 7 to 12 days) as madhyama “middling in merit” and the first three (from 1 to 5 days) as” kanyaasa “inferior. Some Vaishnava texts (e.g. Hayasirsha_Samhita-36, 4) however, do not, approve of Uthsavas that stretch beyond twelve days. Dwaja avarohana (taking down the flag ceremonially and concludes the Utsava). The most important Uthsava in a temple is of course the Brahmothsava. It is believed Brahma himself conducts the Uthsava in honor of the presiding deity of the temple. Brahmothsava is usually a grand occasion. It is spectacular, colorful, and full of gaiety; and draws huge enthusiastic crowds. Brahmothsavas also carry social, economical and political significance. The scale and splendor of the Brahmothsava is often an index of a temples affluence, popularity and prestige. Agama texts mention five kinds of Brahmothsava. 1. A one-day Brahmothsava (Brahma) intended to enhance the spiritual power of the temple (Brahma tejo vriddhi). 2. A three-day Brahmothsava (Saiva) to eradicate obstacles that bother the devotees (Vighna nashana). 3. A five-day Brahmothsava (Aindra) to prevent occurrence of famine and drought (durbiksha nashana). 5. A nine -day Brahmothsava (Daivika) praying for protection and happiness of the people (Sarva rakshithartha.Praja sukhavaha). Brhmothsava of nine days is the best (satvika) followed by Uthsavas of seven days (Rajasa) and five days (mishra). The most impressive and spectacular event of the Brahmothsava is of course the procession of the icon of the presiding deity in an elaborately decorated chariot (Ratha) to the accompaniment of music , dance , chanting , cheers from the crowds of devotees and the fireworks. This procession marks the climax of the series of Brahmothsava rituals. During these processions, the temple icon is each day mounted on a different model of birds and animals (Vahanas).The Agama texts prescribe the Vahanas (vehicles) to be used on each day of the festival. Garuda Samhita prescribes the Vahanas for a fifteen day Brahmothsava a s follows: flower pavilion, solar orb, lunarorb,peacock, Garuda, Hanuman, horse,swan,swing,Kalpatharu(wish-fulfilling tree) and flower chariot(Pushpaka ). Another aspect of these Utsavas is that the Utsavas and the daily worship that goes on in the sanctum are mutually independent. The daily worship to the main idol goes on serenely, unaffected despite all the excitement and feverish activities that go around the temple. The mula_sthana, dhruva_bheru that is the main idol in the sanctum is not associated with the Uthsavas. It is the moveable idol, the chala _bheru also called Uthsava_bheru (usually made of metal) that is pressed into the Uthsava rituals, processions and other celebrations. Uthsavas are excellent examples of teamwork. All sections of the community do participate for its success. Apart from devoted volunteers , Uthsavas call upon the services of experts in Tantra and Rituals , Astrologers, carpenters , smiths, flower decorators , musicians, cooks, craftsmen, and in addition to effective managers , leaders as also masters of ceremonies and others. It is an occasion when the entire community comes together, works as a team, and shares its burden, responsibility and success. Agama Kosha by Prof.SKR rao. The word puja meaning worship signifies fulfillment of the prescribed rituals (puryante sarva karmani) and realization of the divine (jayate jnanam atmani). Puja is described in several ways in the Sanskrit lexicon Amara kosha. It says puja is synonymous with saparya, archa, varivasya, parichaya and upasana. All the terms meaning worship. The methods of worship involve certain rituals called Upacharas or services. Offering flowers to the deity during the upachara is an integral and an important part of worship. It signifies submission of self to the Lord. There is also an opinion that suggests , Puja representing submission of flowers to the deity with devotion and reverence is mainly a practice derived from Southern India. According to them, the term puja is derived from Pu meaning flower in southern languages. Flowers constitute an important article of worship. The image in the sanctum is decorated with garlands flowers and with unstrung flowers. The flowers are offered to the deity at several stages in worship. Flowers gladden the heart and mind; and confer prosperity. Flowers offered with devotion gratify the Lord. The devotees who visit the temple also offer flowers as token of love and devotion. Mahabharata (Anushasana parva- Section-xcviii) describes the flowers fit for offering to deities:” Flowers are of diverse kinds. Some are wild; some grow in the midst of humans and even among them, some do not grow well unless nurtured with great care. Some flowers are from plants grown on mountains; some are from trees that are not prickly; and some from trees that are prickly. Fragrance, beauty of form and taste are also the reasons for their classification. The scent that flowers yield is of two kinds, agreeable and not agreeable. The flowers that emit agreeable scent should be offered to deities. Flowers of plants that are not prickly are generally white in color. Such flowers are acceptable to deities. One desirous of wisdom should offer garlands of aquatic flowers like lotus. Flowers of plants born on mountains and in vales and of sweet scent and aspect sprinkled with sandal paste should be duly offered to Gods. Such offerings gratify the Gods. Agama texts classify flowers fit for worship according to their colour, fragrance, shape and origin. They prescribe the type of flowers that may be used in worship. They also mention about flowers that may not be used in worship. In general, flowers that carry a strong odor or that are odorless; flowers un-blossomed or too old; flowers bitten by insects or otherwise mutilated; and flowers picked and kept unused for a day or more are to be avoided. Flowers grown in a garden ( aarama) are considered best; flowers collected from forest (vana) rank next; and flowers bought (vikrita) are inferior. Flowers are also classified according to the gunas they represent. For instance the sattvika (superior) type of flowers have mild colors and mild and sweet fragrance. These include svetarka (white calotropis), nandyavartha, and drona (leucas linifolia), sveta-padma (white lotus), jati (jasmine), mandaara (coral tree, erythrina Indica), maalathi (jasminum grandiflorum), punnaga (rottleria tinctoria), kurava , sara-patrika ( anethum sowa , a kind of rose), etc. The rajasa-(middling) flowers are of slightly stronger color and fragrance. These include flowers such as brhati (solanum), dhattura (white thorn apple, datura Alba), raktotpala (red lotus), palasa (butea frondosa), patala (trumpet flowers) etc. The tamasa (inferior) variety of flowers may not be used in daily worship (varjita) in temple but may be used on festival occasions say for decorating the temple car or the image carried in procession in public. This class of flowers include blossoms of the cotton plant (karpasa), ketaki (pandanua odoratissimus), kasa grass (saccharum spontaneum), japa (China rose), sripran (a variety of lotus, gmelina arborea), vibhuthika (terminalia bellerica) and bandhuka (phoeniciea) etc. Along with the flowers, certain leaves such as tulasi (basil), bilva (bel) and the dhruva grass are used in daily worship. While decorating the image , one part of it must be covered with flowers, one part with cotton or silk apparel , one part with ornaments and jewels and one part must be left clear for worship (puja_bhaga).The colorful garlands are hung around the neck of the deity , reaching ankles. Unstrung flowers are placed at the feet of the deity; the ritual being called pushpa_nyasa. Water has a variety of applications in temple ritual and is highly essential. One cannot think of worship and ritual in a temple without use of water in some form or other. The Agama texts prescribe that water for use in worship is collected from a running stream, a spring, a natural lake or a well exposed to sunlight and fresh air. A temple therefore is necessarily built on a site that is well served by supply of fresh water. Even those temples situated away from a stream do have in their premises a natural or an artificial pond usually calledPushkarini, which serves exclusively as a source of water required fortemple rituals. It also serves as an arena for sporting the occasional Jala kelior the Teppam float festival. 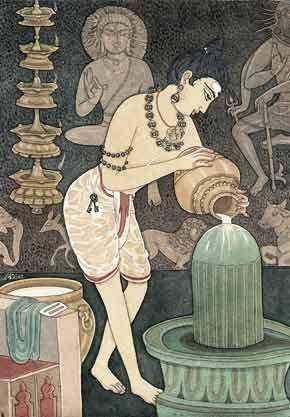 Water used in the sanctum has to be ritualistically pure; and can be collected only by the priest when he is ready to commence the day’ service. While other people can bring in the other articles required for worship such as flowers, fruits etc., the priest alone should bring in water required fortemple rituals. All articles used in worship and brought into the sanctum are sanctified by sprinkling water brought in by priest. Water has several applications in temple worship apart from cleaning the sanctum. Concerning the main image in the sanctum, water has four principle applications. The water designated for each purpose is stored in a separate vessel. Those vessels, five in number, are arranged in a specified order on a circular plate, on a tripod stand placed in front of the image within the sanctum. These waters are sanctified by recitation of appropriate mantras. The other articles used in worship and the platform on which the worship is conducted are purified by sprinkling the sanctified water. (1) Paadya: Paadya is Water for washing the feet of the lord. The vessel containing water meant for this purpose is placed in the South-West corner of the circular plate. Paadya is mixed with four substances viz. khus khus (usira), Sandal wood paste (chandana), blades of durvaa grass and white mustard (siddha). This act of devotion and reverence is accompanied by recitation of hymns such as Purusha Suktha , Rudra Paata or other hymn as is appropriate. 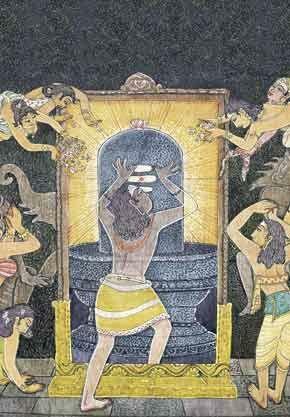 (4) Snana: The ritual bath is known as snana, abhishekha, or marjana.Abhisheka is an act od love,reverence and submission.It purifies the worshipper’s mind and fills with devotion.The water meant for ceremonial bath is placed on the North-East corner of the circular plate.Snana water is elaborately prepared with use of herbs, spices, flowers and creams/lotions. The herbal bath is made up of herbal decoction (kashaya) of the barks of seven types of trees: palasha, oudumbara, ashvattha, madhuka, plaksha, patala, and jambu. Panchamrita is an amalgum of fruits such as banana, mango etc.mixwed with five substances : milk,curds,ghee,honey and sugar.This Snana follows a sequence.The bath in milk (dugdha) is followed by bath in curds(dadhi), in ghee(gritha), in honey(madhu) and in sugar(sharkara). This is followed by bath in tender coconot water(narikela). With each of the five articles, a form of Vishnu is invoked; Govinda with milk, Vamana with curd, Vishnu with ghee, Madhusudana with honey and Achyuta with sugar. The snana is accompanied with recital of appropriate hymns. 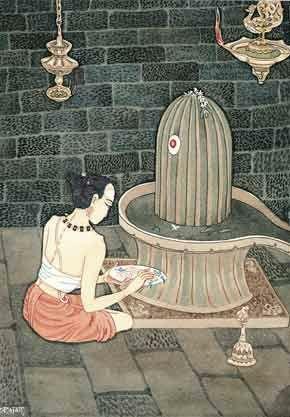 Sometimes a shower bath with a silver plate having a thousand holes (sahasra dhara) is given to the idol. The fifth vessel placed at the centre of the circular plate holds water meant for general purpose (sarvathra toya); and is mixed with Tulasi leaves, flowers, gingelly seeds and sandal paste. An occasional purification bath is conducted on astrologically significant days such as ayana or vishva or on solar or lunar eclipses or on certain auspicious days. For purpose of purification, five products of cow (pancha-gavya) ghee)-ghrita (representing Rudra and regarded most adorable), curds –dadhi (representing Soma a symbol of progeny), milk-kshira(representing Sukra helpful in eliminating enemy), cow’s urine – go_ mutra(representing Nata and indicative of prosperity) and cow dung-go_maya(representing arka or sun, beneficial in warding off diseases. There is a standard method for preparing this concoction he cow dung is mixed with cow’s urine; and then this mixture is put into ghee which in turn is mixed with curds; and finally the whole mixture is put into milk. Water is used at every stage of worship- before, during and after the worship. Apart from this, the priest performs certain rituals preliminary to worshipand at the conclusion of the worship, for which sanctified water is essential. The devotees , with reverence and devotion , in fulfillment of their worship, receive Thirtha or Charanmrit , a residue from the Snana offered to the idol .Prasad and Thirtha are most sacred and purifying. They are most sought after and one who receives them considers himself fortunate and blessed. The Hindu temples are complex institutions. They represent the culmination of social and religious aspirations of a society. Temple is the focal point in the life of a community and often represents its pride, identity and unity. It is also the index of the community’s wellbeing. It draws into its fold people from its various segments and denominations; and binds them together. In smaller communities the temple apart from being a source of spiritual or religious comfort, also serves as center for education and recreation. The term Agama primarily means tradition. Agama Shastras are not part of the Vedas. The Agamas do not derive their authority directly from the Vedas. They are Vedic in spirit and character and make use of Vedic mantras while performing the service. That is the reason they are regarded as authoritative. One often hears Agama and Nigama mentioned in one breath as if one follows the other or are closely related; whereas Nigama stands for Vedas and Agama is identified with Tantra..The two traditions- Veda and Tantra – hold divergent views on matters such as God; relationship between man and God; the ways of worship; and path to salvation etc.The Vedic concept of God is omniscient, omnipotent, a formless absolute entity manifesting itself in phenomenal world of names and forms. 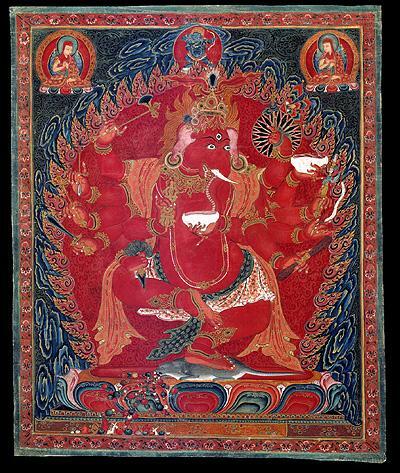 The Agama which is a part of Tantra regards God as a personal deity with recognizable forms and attributes. Vedic worship is centered on the fire- (the Yajna), certain religious and domestic rituals, (shrauta sutraas and griyha sutraas), and the sacraments, (samskaara). In this tradition the gods and their descriptions are, mostly, symbolic. The hymns of the Rig Veda are inspired outpourings of joy through sublime poetry. The Yajur and Sama Vedas do contain suggestions of sacrifices; but they too carry certain esoteric symbolic meaning. Very few of these rituals are in common practice today.\The most widespread rituals of worship today are of the Aagamic variety. The Agama methods are worship of images of God through rituals (Tantra), symbolic charts (Yantra) and verbal symbols (Mantra).Agama regards devotion and complete submission to deity as fundamental to pursuit of it aim; and wisdom, enlightenment (jnana) as that which follows eventually by the grace of the worshipped deity. The approach of Agama is basically dualistic, seeking grace, mercy and love of the Supreme God represented by the personal deity, for liberation from earthly attachments (moksha). As compared to Vedic rituals (Yajnas) which were collective in form, where a number of priests specialized in each disciple of the sacrificial aspects participated; the Tantra or Agamic worship is individualistic in character. It views the rituals as a sort of direct communication between the worshipper and his or her personal deity. The Yajnas always take place in public places and are of congregational nature, where a large number participate with gaiety and enthusiasm. The Tantra rituals, on the other hand, are always carried out in quiet privacy; self discipline and intensity is its hallmark not exuberance or enthusiasm. The culmination of these two dissimilar streams of worship is the temple worship. Though one concedes that representation of Godhead is theoretically impossible; yet one has to recognize that an image helps contemplation, visualization and concretization of ideas and aspirations. Here, at the temple , both the Vedic and the Tantric worships take place; but each in its sphere. A temple in Hindu tradition is a public place of worship; several sequences of worship are conducted in full view of the worshipping devotee; and yet another set of rituals are conducted by the priests in the privacy of the sanctum away from public gaze. The temple worship is guided by its related Agama texts which invariably borrow the mantras from the Vedic traditions and ritualistic details from Tantric traditions. This had the advantage of claiming impressive validity from Nigama, the Vedas; and at the same time carrying out popular methods of worship. For instance, Vedic mantras are chanted in traditional manner while performing services such as ceremonial bath, adoring the deity with flowers, or waving lights. In addition, the worship routine was rendered more colorful and attractive by incorporating a number of ceremonial services (upacharas) and also presentations of music, dance, drama and other performing arts. These also ensured larger participation of the enthusiastic devotees. Agamas are a set of ancient texts and are the guardians of tradition .They broadly deal with jnana (knowledge), Yoga (meditation), Kriya (rituals) and Charya (ways of worship).The third segment Kriya (rituals) articulate with precision the principles and practices of deity worship – the mantras, mandalas, madras etc. ; the mental disciplines required for the worship; the rules for constructing temples and sculpting the images. They also specify the conduct of other worship services, rites, rituals and festivals. The fourth one, Charya, deals with priestly conduct and other related aspects. They hold the view that Japa, homa, dhyana and Archa are the four methods of worshipping the divine; and of these, the Archa (worship) is the most comprehensive method. This is the faith on which the Agama shastra is based. The Agama shastra is basically concerned with the attitudes, procedure and rituals of deity worship in the temples. But it gets related to icons and temple structures rather circuitously. It says if an image has to be worshipped it has to be worship worthy. The rituals and sequences of worship are relevant only in the context of an icon worthy of worship; and such icon has to be contained in a shrine. And an icon is meaningful only in the context of a shrine that is worthy to house it. That is how the Agama literature makes its presence felt in the Silpa-Sastra. The icon and its form; the temple and its structure; and the rituals and their details, are all thus interrelated. I think , the most present Hindu rituals of worship seem to have developed after the establishment of the six orthodox schools of Hindu philosophy (darshanas). The changes in religious rituals from the Vedic to the Aagaamic seem consonant with the themes prevalent in the six orthodox systems. A very significant change is the integration of Yoga methodology into the rituals. Four of these eight stages are an integral part of all ‘worship’ – namely, posture, (aasana), breath (life force)-control, (praanaayaama), placing or fixation, (nyaasa or dhaaranaa), and deep concentration & contemplation (dhyaana). . The temple architecture too follows the structure of the human body and the six chakras’ as in yoga. As regards Vaikhanasa, after the emergence of temple _culture, Vaikhanasa appear to have been the first set of professional priests and they chose to affiliate to the Vedic tradition. That may perhaps be the reason they are referred to also as Vaidikagama or Sruthagama. Yet, there is no definite explanation for the term Vaikhanasa. Some say it ascribed to Sage Vaikhanasa; while some others say it is related to vanaprastha, a community of forest-dwellers. As regards their doctrine, Vaikhanasas claim to be a surviving school of Vedic ritual propagated by the sage Vaikhanasa. 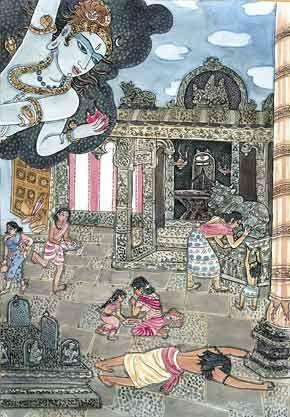 Most of Vaikhanasa is almost completely concerned with ritual, prescribing the rituals and their rules of performance of yaga, yajnas etc. To the Vaikhanasas, their temple worship is a continuation of Vedic fire sacrifice. The Vaikhanasa doctrine states that moksha is release into Vaikunta determined by the nature of a man’s devotion and faith experienced mainly through archana, service to the deity. The Vaikhanasa is regarded orthodox for yet another reason; they consider the life of the householder as the best among the four stages of life. Because, it is the householder that supports, sustains and carries forward the life in the society. They treat the worship at home as more important than worship at the temple. A Vaikhanasa has therefore to worship the deities at his home before he leaves for his duty as a priest at the temple. There is not much prominence for a Yati or a Sanyasi in their scheme of things. The Agama texts make a clear distinction between the worship carried out at his home (atmartha) and the worship carried out as priest at a temple(parartha ) for which he gets paid. A person who receives remuneration for worshipping a deity is not held in high esteem. This perhaps led to a sort of social prejudices and discriminations among the priestly class. But, with the change of times, with the social and economic pressures and with a dire need to earn a living, a distinct class of temple-priests , naturally , crystallysized into a close knit in-group with its own ethos and attitudes. From the end of the tenth century Vaikhanasa are prominently mentioned in South Indian inscriptions. Vaikhanasas were the priests of Vaishnava temples and were also the admistrators. However with the advent of Sri Ramanuja, who was also the first organizer of temple administration at Srirangam Temple, the Vaikhanasa system of worship lost its prominence and gave place to the more liberal Pancharatra system .Sri Ramanuja permitted participation of lower castes and ascetics , the Sanyasis ( who were not placed highly in the Vaikhanasa scheme) in temple services. He also expanded the people participation in other areas too. This change spread to other Vaishnava temples particularly in Tamil Nadu. 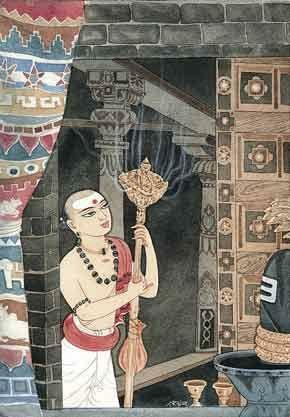 Vaikhanasas, however, continued to be important mainly in Andhra Pradesh, Karnataka and some temples in Tamil Nadu. As regards Pancharatra, it appears to have been a later form of worship that gained prominence with the advent of Sri Ramanuja .Pancharathra claims its origin from Sriman Narayana himself. And, Antaryamin, or the indwelling immanent form of God as present throughout in creation. The peak of Vaishnava devotion is recorded in Dashamaskanda, the Tenth Book of the Bhagavata Purana, and in Nalayira Prabhandam the four thousand Tamil verses of the Vaishnava saints the Alvars, and especially in the thousand songs known as Tiruvaimozhi of Nammalvar. The ecstasy of the Gopi-type of God – intoxicated-love is exhilarating and gives raise to divine intoxication in Nammalvar’s poetic compositions. Therefore the Tamils verses and songs are prominent in Pancharatra worship. This method also employs more Tantras, Mandalas and Uthsavas which makes room for a large number of devotees of all segments of the society to participate. There are here more Jaanapada (popular) methods of worship than mere Vedic performance of Yajnas. Even here, each prominent temple follows its favorite text. That is the reason there are some minor differences even among the Pancharatra temples. Among the differences between Vaikhanasa and Pancharatra, the latter say they gain eligibility to worship (Diksha) after the ceremonial Chkrankana, which is imprinting the symbols of Vishnu imprinted on their body. Vaikhanasa see no need for such a ritual. The pregnant mother is given a cup of Payasam with the Vishnu seal in the cup. They recognize as worthy only such Garbha_Vaishnavas. Vaikhanasa consider Vishnu-Vaikhanasa-Brighu as the guru_parampara; while Pancharatra consider Vishnu_Vishvaksena_Satagopa_Nathamuni_Yamuna_Ramanuja as the guru -parampara. Vaikhanasa think it is enough if the daily worship is performed once in a day or if needed it could be stretched to six times in a day (shat kala puja). Pancharatra do not place any limit. If needed the service could be even 12 times a day, they say. The other differences are that Vaikhanasa worship is considered more Vedic, the mantras being Sanskrit based and there is a greater emphasis on details of worship rituals and yajnas. Even here, the householders and celibates get priority in worshipping the deity. They consider Griha_archana the worship at home as more important than the congregational worship. The Sanyasis or ascetics have no place in this system. What is more important than the rituals is the symbolism that acts as the guiding spirit for conduct of rituals. At a certain level, symbolism takes precedence over procedures. I think ultimately there is not much difference between Pancharatra and Vaikhanasa traditions. Both are equally well accepted. The differences, whatever they might be, are not significant to a devotee who visits the temple just to worship the deity and to submit himself to the divine grace. More of that in the next segment.